A good day’s walk does not happen purely by chance and if you want your walk to be successful you need to plan it carefully and take a number of factors into consideration. You need to ensure that any walk you plan suits all members of your walking party. This means considering the types of locations you all prefer to walk in - for example, do you choose on the flat, hilly regions, along a coastal route etc? You must also factor in the walking capabilities of all your companions and ensure that everyone is going to be able to complete the walk. Don’t forget to include dogs in this if they are going to be walking with you. Extremes of weather can have a major impact upon a walk and, in some instances; it can be highly dangerous to walk on certain routes if you encounter severe adverse weather conditions. Prior to your walk, you should keep a close watch on the weather forecast and do this right up to the morning of your walk. The golden rule is to postpone the walk if you’re in any doubt about bad weather on the day of the walk. It doesn’t matter if you’ve been planning the walk for ages and people are travelling a long way to take part. The inconvenience of postponing a walk due to adverse weather means nothing compared to the risks to your party’s safety if you decide to soldier on regardless – it simply isn’t worth the risk and you can always walk another day. 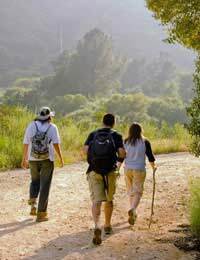 Remember, too, that the weather can change dramatically, especially up in the hills, so if you have access to a local park ranger service or weather station situated at the location where you intend to walk, contact them on the morning of the walk and let them determine if they think it’s safe to walk your planned route. You need to be able to come up with a decent estimation of the length of time your walk is going to take. When working this out, it’s important that the time you come up with takes into account the pace and ability of the slowest walker in the group. Also, remember that if you’re walking at altitude, your ascent and descent need to be factored in too as this has a marked effect on your usual walking speed and the distance you can cover within a set time. In essence, you need to be certain that your party can get back to ‘base’, be that a return home or a campsite you intend reaching, well before dusk. If the weather’s been bad before the day of your walk, especially if there has been heavy rain and/or strong winds, that also needs to be factored in to your timings. You may also be planning some activities along your route – bird watching or photography, for example. Make sure that your route is suitable for any activities your party wish to participate in and also allow time for these when you come to estimating the length of time your walk will take. Find out if there are any specific rules, restrictions and permits needed along your route before setting off. If you are intending to camp, you need to locate suitable camp sites and, if necessary, check out whether you need to book a pitch in advance of your trip and what facilities, if any, the camp site has. What you should take with you and what you should do in the event of an emergency are discussed in other articles on this website. However, taking the right gear is one thing but knowing how to use it is another so you should practice mastering anything you’re not familiar with before you go. Likewise, with emergencies, things like first aid kits are vital but, once again, they’re useless if you don’t know how to use them. A well planned walk leads to a far more enjoyable experience for everybody and greatly reduces the risk of encountering any difficulties so it’s important to plan ahead and prepare for any unexpected eventualities as best as possible prior to setting off. A good rule of thumb is to see how long the walk would take if you're going 2 1/2 miles an hour and then add on an extra hour for different kinds of stops, going slow as people chat. That way no one's going to feel pressured, and everyone can simply relax and enjoy it (and that's meant to be the point, isn't it?). Even if you're the leader you shouldn't need to keep pushing or cajoling people unless the party's running really late. Just enjoy the countryside in all its glory.